-Schedule an appointment with your mover and receive a written estimate based on your moving plan and the size of your home. -Check with your company to determine which moving services are covered during the move, if any. -Make sure you show the agent (or tell them) everything you plan to move in order to receive the most accurate cost estimate. That might include the attic, shed, backyard, or offsite storage units. -Sign the estimate from your mover and thoroughly read the agreement to understand each section. Different movers have different policies and areas of coverage. -Schedule your move out date and check with your mover to make sure that date works. -Start notifying people and businesses that you’re about to move. Start with the US Postal Service, where you can file an online change of address form from the official USPS website. -Call your bank, insurance provider, credit card company, and other important services to tell them you’re moving. -Call your doctor, accountant, lawyer, dentist, and any other professional services. -Change any magazine or newspaper subscriptions. -The fewer things you have to move, the easier your move will be. Go through every room and storage space in your home and identify things that you don’t want to move, don’t need, or want to give away. -Consider hosting a garage sale or selling stuff online (use local classified sites like Craigslist). -Donate unwanted clothing, furniture, and household items to charities around town. Call ahead to make sure they actually need the stuff you’re donating. Most charities will provide receipts displaying the approximate value of the donated item for future tax deductions. -Change your food buying habits. Only buy food you need up until the moving day. Otherwise, you’re going to end up with a lot of leftover food to throw out or bring with you. -Start using up paper towels, toilet paper, household cleaners, and other household item. -Depending on how much stuff you got rid of in Week 5, you may have a significantly different moving inventory. Talk to your mover and tell them about all of the stuff you just sold. It could change your final quote or your moving requirements. -Double check to ensure your mover has your necessary contact information, your destination address, and any other important information. Check that the date still works for all parties. -Talk to your friends and family and tell them about the move. Schedule goodbye dinners or host a farewell event at your place. -Talk to your children about the move and give them time to say goodbye to any friends or important places around town. -Confirm your travel arrangements. If you’re driving, make sure your car is prepared for the upcoming road trip. Get a maintenance checkup. Book any hotels along the way if needed and plan out your stops. -Set aside everything you need for your first night in your new home and make sure those things don’t get packed with the rest of your moving stuff. 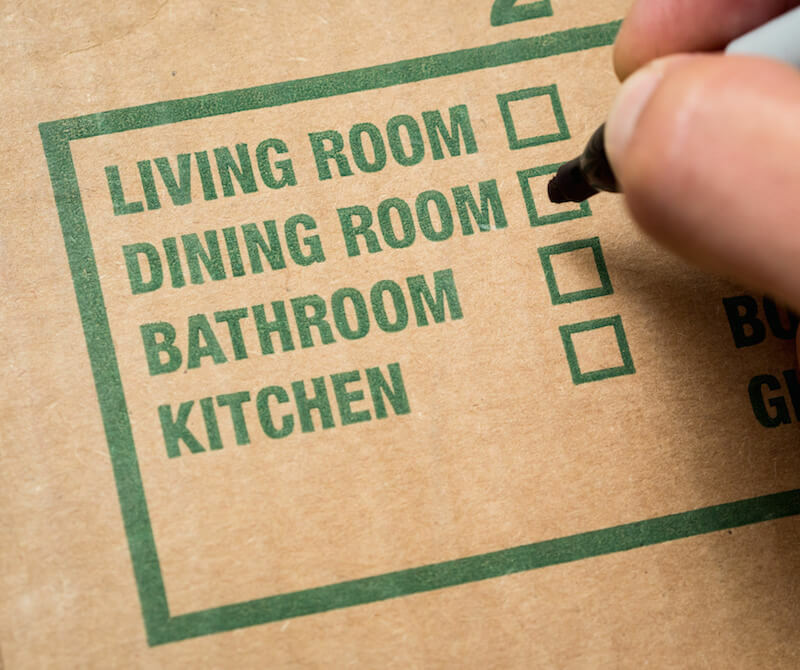 Keep these things with you during your moving day. -Read through the list of packing tips below and map out your moving strategy. -Clean certain hard-to-clean items in your home, like rugs and draperies that you plan on moving. Once they return from the cleaner, leave them wrapped for the move. -Have an appraiser assess certain expensive items before you move and receive a receipt for the value of those items in writing (just in case). -Put aside a box that will be the last box loaded and the first box unloaded. This box should contain essential items you might need on your first night, like bottled water, toothpaste, soap, or a first aid kit. -Call a service technician to prepare major appliances for the move (if you’re moving those appliances). -Call your utility company and confirm the date when all of your utilities will be disconnected. -Dispose of flammable items or dangerous goods (most moving companies won’t move these things for you, so check with your mover). Common non-movable items include flammables, fireworks, cleaning fluids, ammunition, poisons, and matches. You should also drain fuel from your power mower and recycle the propane tank on your grill. -Make travel arrangements for your pets and ensure your kennel or carrying container fits in the car, or is allowed on the airplane. -Talk to your vet to ensure your pets have all of their required shots and health certificates. These requirements can vary when moving from state-to-state, so this is important. -Pick up anything you’ve sent away for cleaning, storage, or repairs over the last few weeks. -Empty your locker at the club or gym. -Read through the list above and make sure you haven’t forgotten anything important. -Check with your mover one more time and confirm all of the details and any changes that may have taken place. -Make sure your electrical equipment and appliances have all been properly serviced for the move. -Set aside fragile items and mark them appropriately (like “this side up” or “fragile”). -Label boxes you want removed from the moving truck first when they arrive at your new home, like valuable items and electronics. -Double-check all your packed boxes to ensure they’re firm and secure. Moving companies may not accept boxes that are torn, broken, or falling apart. -Unplug your electronic appliances 24 hours before you move. This keeps them at room temperature for the move. This is important for home computers, stereos, and audio or video equipment. -Collect things that you want to be packed together, like toys for your child’s room or kitchen stuff. -Supervise as your items are loaded into the truck. Perform a final tour of the house and double check the inventory list. Your mover will typically provide you with your own copy of the inventory list for reference. -Check to make sure the driver knows the exact destination address. Give the driver your contact information. -Take a last look around your home and make sure the water, furnace, air conditioner, and lights are all switched off. Shut and lock all windows. -Leave your old keys and garage door opener. -Ideally, you’ll be at the home to accept the delivery of all your possessions. If not, then you’ll need someone there to accept the delivery and pay the movers. -Check your possessions for damages and see if there is anything missing based on your inventory. Once you sign the inventory receipt, you acknowledge that you’ve received all of the items listed on that receipt. -Tell your movers where each piece of furniture will be placed along with all mattresses. -Consider leaving a floor plan of your new home by the entrance to make your movers’ lives easier. -Instead of turning your new electronics on right away, let them sit for 24 hours to adjust to the new room temperatures. -Check with your new post office to see if any mail has been held there for you. -Look up your new state or city’s driving requirements, like auto registration requirements and any driver’s license changes. -Consider scheduling an appointment with an attorney to discuss local laws and how those laws might affect you. Specific things that change from state-to-state include wills, inheritance laws, transfers of property, investment laws, insurance regulations, and taxes. These laws come into effect as soon as you move to your new area, so the sooner you check, the better. -Plan out your packing strategy. The first items you pack should be the things that you don’t use often (and won’t need until after you move). -The sooner you start packing, the better. Start packing as soon as you know you’re moving. Your future self will thank you. -Create good cushioning inside boxes using generous amounts of paper. -Don’t pack flammable items or other dangerous goods. Most movers won’t carry them. Specific banned items include flammables, matches, fireworks, and ammunition. Check with your mover to see if they have any additional restrictions. -Use a marker to write the contents of each box on the side as you pack. -Separate breakable items and non-breakables into different containers. -Pack containers tightly so the contents can’t move around, but not so tight that they are forced against one another. -Don’t use masking tape or duct tape to secure your boxes. Use professional packing tape. -Try to pack electronics in their original boxes (you kept all those boxes, right?). If you didn’t keep the boxes, find new boxes and pack those boxes with lots of packing material. Wrap your electronics with paper to protect them, then place them into the box. Stuff more packing material all around to secure it, then firmly seal the container. -To pack china, use sheets of clean newsprint paper (regular newspaper could leave ink stains). Wrap each piece of China individually in paper, then wrap them together in bundles of three. Add more paper on top to create the next tier (you may want to use horizontal cardboard dividers). Pack big items at the bottom of boxes and smaller plates, saucers, and shallow bowls higher up. -To pack books, stack them in a carton and alternate between the spine and open side as you stack. Place a piece of paper between the books to prevent them from sticking together.